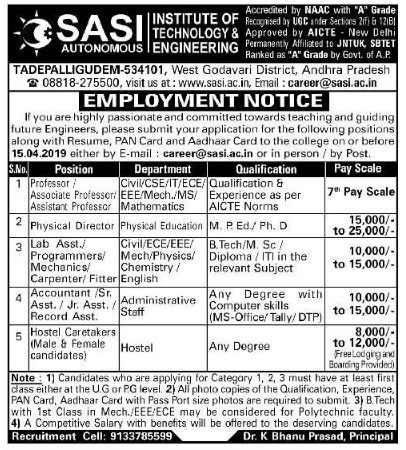 Sasi Institute of Technology and Engineering, Tadepalligudem has advertised in the EENADU newspaper for recruitment of Professor / Associate Professor / Assistant Professor Plus Non-Faculty jobs vacancies. Interested and eligible job aspirants are requested to apply on or before 15th April 2019. Check out further more details below. About College: Sasi Institute of Technology and Engineering (SITE) is not just one more engineering college. It's a college with a difference. It has made its presence felt more with its academic discipline, results and the achievement of its students. Though started a few years back i.e. in 2002, it has set to compete with the best in the state. Providing the best education in engineering and technology and following the systems that SASI has developed over two decades, it has made its mark already in the minds of millions. The campus is located amid lush green fields in the spacious area of 28 acres offers world class facilities. It is well connected to rail and road transport. How to Apply: Interested and eligible candidates are requested to send detailed Resume along with all copies of certificates / testimonials, copy of PAN card, copy of Aadhaar card and one recent PP size photo to the email address or postal address provided here or in person.